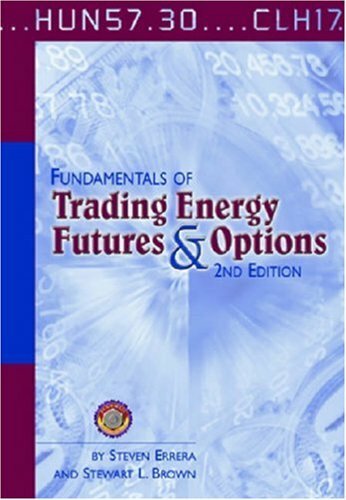 Fundamentals of Trading Energy Futures and Options by Errera and Brown was one of the better books on the subject in my experience. Because the book was written as a guide for commercial entities' risk management objectives, it gives the reader some interesting ideas around the (possibly exploitable) behavior of large institutional trading. The book assumes no former familiarities with energy commodities, and explains the mechanics of energy futures and futures options, covering mostly crude oil, natural gas, and associated derivative products. Unlike so many crappy quasi-sales books in the field, the authors do not advocate trading of energy futures or futures options, and instead take an impartial role. The authors did a great job going over the high volume exchange supported energy spreads e.g. crack, spark spreads, heating vs. gasoline, and etc. It is absolutely fascinating to learn the industrial processes that influence changes in spread values; this is the kind of information edge with potential for making money, with significantly more value than quantitative curve fitting empirical data. Like me, the authors also found little value from technical analysis, at least in the pure form. Over all the book is a great primer on energy derivatives.